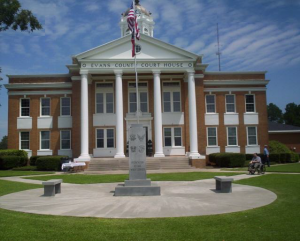 Welcome to the official web site of the Office of the Clerk of Courts of Evans County, Georgia. This site is maintained primarily for the benefit of the citizens of Evans County and others who require servies from the Office of the Clerk of Superior, State and Juvenile Courts. My goal as clerk of the various courts is to provide information and services on-line, thus facilitating the most expedient and inexpensive delivery of services to taxpayers and other customers. Thank you for visiting the Office of the Clerk of Courts. If I or my staff can be of service to you, please feel free to contact me at the address or phone numbers shown. O.C.G.A. § 15-6-51 makes the unauthorized practice of law illegal. Specifically, it bars any person other than a duly licensed attorney at law of this state from rendering or furnishing legal services “of any kind in any actions or proceedings of any nature.” This provision, while serving to protect the interests of individuals and preserving the sanctity of the practice of law in Georgia’s courts, creates a tenuous fine line that clerks of superior court and our employees have to be careful not to cross as we try earnestly to help persons availing themselves to and seeking relief from the courts we serve. 6) Any action taken for others in any matter connected with law. The illegal practice of law is punishable as a misdemeanor. I serve superior, state, and juvenile court—all are courts of record, which means that all pleadings (documents) must be filed in writing and in a format mandated by statute and Uniform Rules of each court approved by the Supreme Court of Georgia. By law, anyone has the right to represent himself or herself pro se (i.e., on his or her own behalf and without the services of a lawyer) in any action civil or criminal action in any court. Laws effective on January 1, 2013 require representation of a juvenile in any action in juvenile court and, in most “children in need of services” (formerly referred to as “deprivation’) cases, parents of children are required to have a legal representative and, if they cannot afford an attorney, the court appoints one for them. The best advice that my staff, anyone else, or I can provide a party in any court case is to hire a competent attorney. When an individual represents himself or herself and tries to litigate issues on his or her own behalf, he or she does so at great risk. It is extremely difficult for anyone to objectively and effectively represent himself or herself in light of the severity of issues involved and the intricacies and technicalities of “practicing law” required for litigating such issues. Even attorneys need legal representation when they are a party to a lawsuit. Many parties in civil cases are indigent and cannot afford legal representation. By law, indigent criminal defendants are entitled to legal representation through the state’s public defender program; however, there is no free legal representation provided for civil litigants in most courts and counties of this state. Georgia Legal Aid Services Program (GLASP) has an office in Savannah. It offers free legal services in civil cases to persons who cannot afford to hire a lawyer. The program only provides representation to clients who “have ‘high stakes’ problems, such as domestic violence, eviction or foreclosure, denial of hard-earned benefits such as unemployment, inability to get critically needed healthcare or food aid…” (For more information about GLASP’s services, visit www.gisp.org). Persons ineligible for legal aid services usually have nowhere to turn for help other than the Clerk’s Office, which is typically the only office in the local judicial system in which anyone will listen to, talk with, and try to help them. Most commonly, they need help because they are facing ominous circumstances and in desperate need of legal representation. Having nowhere else to turn, they come to the Clerk’s Office seeking legal counsel from staff or the clerk. In most cases, we would love nothing more than to be able to help them. This is where the thin line between being trying to help and illegally practicing law becomes an issue. The chief goal of the Clerk’s Office is to help everyone in the most professional, efficient, and impartial manner possible. More importantly, staff and I care about people and their circumstances in life; so, we sincerely endeavor to do all we can to help people within legal parameters. However, even if it were legal, we should not dispense legal advice. While we are adroitly skilled in clerical procedures and the fundamentals of litigation, our expertise does not qualify us to counsel individuals with respect to their legal rights. On August 11, 1914, the Georgia General Assembly proposed a constitutional amendment to create Evans County from Bulloch and Tattnall counties. Georgia voters ratified the proposed amendment on November 3, 1914, which marks the official date of Evans County’s creation. There was little debate necessary when it came time to select a name for the new county when it was first proposed. The county fathers chose the name “Evans” for General Clement Anselm Evans, whose service to Georgia qualified him for the respect in which he was regarded. Many Evans County area men served under him in the Civil War. In November 1864, General Evans was named Acting Major-General of the brigade previously commanded by Gen. John B. Gordon. During his term of service, Evans distinguished himself in combat until the final hour of war. In the years following the Civil War, Evans continued to excel in private life, becoming a Methodist minister, preparing “The Confederate Military History”, and later, being elected State Prison Commissioner until his death on July 2, 1911. Claxton, the county seat of Evans County, was incorpated by Tattnall Superior Court in April 1894. The town visionary, W.R. Hendricks, son of Glenn and Nancy Hendricks, had been given a large tract of land by his parents. The Hendricks’ ambition was to secure a railroad station at the site but they met considerable opposition from railroad company officials .Hendricks made a proposition to railroad officials that a well be dug and pump installed free of charge so that trains could stop for water.The deal was made. The vision of building a town was fully supported by his mother who offered to give a lot to anyone who would erect a building upon it. With the establishment of a town well underway, efforts were begun to establish a post office at the settlement already widely known as Hendricks. Postal officials in Washington, D.C., up on receiving an application from George E. Wood, declined to approve the name Hendricks because a post office in the state was already operating under that name in Upson County. Two other names were then submitted, Jenny and Claxton. Postal officials agreed to Claxton and the post office opened in 1890. There is some dispute about the origin of the name Claxton, but it is believed it was inhonor of Philander Priestly Claxton, a noted educator of the time. The City of Claxton is known world-wide as the “Fruit Cake Capital of the World”.